"Yuyue" redirects here. For other uses, see Yuyue (disambiguation). Map of the Chinese plain in the 5th century BC. The state of Yue is located in the southeast corner. Yue (Chinese: 越; Old Chinese: *[ɢ]ʷat), also known as Yuyue, was a state in ancient China which existed during the first millennium BC – the Spring and Autumn and Warring States periods of China's Zhou dynasty – in the modern provinces of Zhejiang, Shanghai, and Jiangsu. Its original capital was Kuaiji (modern Shaoxing); after its conquest of Wu, the Kings of Yue moved their court north to the city of Wu (modern Suzhou). The name "Baiyue" (百越) was applied indiscriminately to many non-Chinese peoples who had been mentioned in numerous classical texts. A specific kingdom, which had been known as the "Yue Guo" (越國) in modern Zhejiang. According to the Records of the Grand Historian and Discourses of the States, the Yue are descended from Wuyu, the son of Shao Kang which as known as the sixth king of the Xia dynasty. With help from Wu's enemy Chu, Yue was able to be victorious after several decades of conflict. The famous Yue King Goujian destroyed and annexed Wu in 473 BCE. Competing against the fewer, more powerful Warring States, Yue did not fare as well. During the reign of Wujiang (無彊), six generations after Goujian, Yue was destroyed and annexed by Chu in 334 BCE. During its existence, Yue was famous for the quality of its metalworking, particularly its swords. Examples include the extremely well-preserved Swords of Goujian and Zhougou. The Yue state appears to have been a largely indigenous political development in the lower Yangtze. This region corresponds with that of the old corded-ware Neolithic, and it continued to be one that shared a number of practices, such as tooth extraction, pile building, and cliff burial, practices that continued until relatively recent times in places such as Taiwan. Austronesian speakers also still lived in the region down to its conquest and sinification beginning about 240 B.C. What set the Yue apart from other Sinitic states of the time was their possession of a navy. Yue culture was distinct from the Chinese in its practice of naming boats and swords. A Chinese text described the Yue as a people who used boats as their carriages and oars as their horses. Their ancestral name is rendered variously as either Si (姒) or Luo (雒). 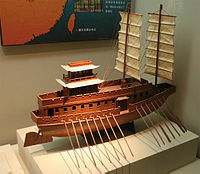 A model of a warship used by the state of Yue during the Warring States period. From the Zhejiang Provincial Museum in Hangzhou, Zhejiang province, China. After the fall of Yue, the ruling family moved south to what is now northern Fujian and set up the Minyue kingdom. This successor state lasted until around 150 BC, when it miscalculated an alliance with the Han dynasty. Mingdi, Wujiang's second son, was appointed minister of Wucheng (present-day Huzhou's Wuxing District) by the king of Chu. He was titled Marquis of Ouyang Ting, from a pavilion on the south side of Ouyu Mountain. The first Qin dynasty emperor Qin Shi Huang abolished the title after his conquest of Chu in 223 BC, but descendants and subjects of its former rulers took up the surnames Ou, Ouyang, and Ouhou (歐侯) in remembrance. Yue is also represented by the star Psi Capricorni or 19 Capricorni in the "Twelve States" of the mansion of the Girl. The virus genus Yuyuevirus and the virus family Yueviridae are both named after the state. Xi Shi, a famous beauty of the ancient Yue Guo. 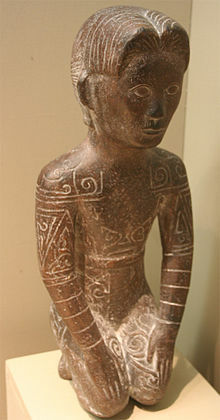 Possible languages spoken in the state of Yue may have been of Tai-Kadai and Austronesian origins. Li Hui (2001) identifies 126 Tai-Kadai cognates in Maqiao Wu dialect spoken in the suburbs of Shanghai out of more than a thousand lexical items surveyed. According to the author, these cognates are likely traces of 'old Yue language' (gu Yueyu 古越語). yuè jué shū 越絕書 (The Book of Yuè Records), 1st c. A.D.
"... The Yuè people call a boat xūlú. (‘beard’ & ‘cottage’)"
"[Líu] Jiă (the king of Jīng 荆) built the western wall, it was called dìngcuò ['settle(d)' & 'grindstone'] wall." This page is based on the Wikipedia article Yue (state); it is used under the Creative Commons Attribution-ShareAlike 3.0 Unported License (CC-BY-SA). You may redistribute it, verbatim or modified, providing that you comply with the terms of the CC-BY-SA.